Good morning from Augusta. 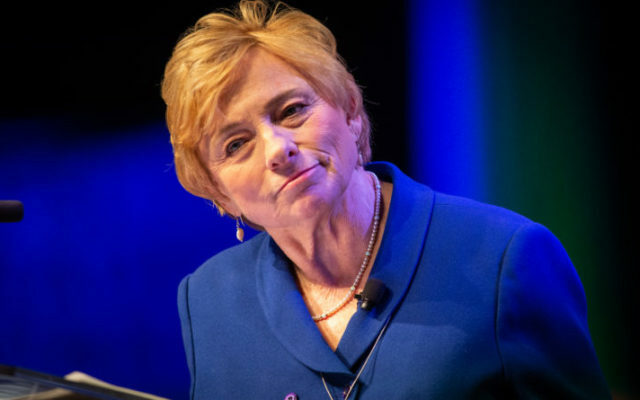 Janet Mills transitioned in earnest from governor-elect to Maine governor with the Friday release of her $8 billion two-year budget proposal, which she will pitch to lawmakers in a budget address on Monday night at the State House. It was a busy, but relatively painless January for the new Democratic governor as her administration worked to fulfill campaign promises it could control by expanding Medicaid and plotting their first steps to address the opioid crisis. That changed after the budget proposal. Mills committed to no tax increases while promising increased spending and the result was a budget spending nearly every dollar expected to be available to Maine through mid-2021 while taking lots of half-measures toward campaign goals. Lots of people are finding issue with that. The budget would constitute a large spending hike while falling short of what lots of progressives wanted to see. The most noticeable thing about Mills’ budget was the topline figure that crested $8 billion, an 11 percent hike over the baseline of the current budget. It is reliant on projections saying Maine will take in $7.9 billion and would balance only after a transfer from the current fiscal year. It doesn’t raise taxes or touch reserves. The reaction from minority Republicans in the Legislature was predictable. They said it was imprudent to spend that much, leaving the budget committee in the difficult position of cutting the budget during months of negotiations that should result in a final budget by spring. The Legislature always rewrites budgets, so what we see now is only a framework. But progressive interests were critical. Among the half-measures in the budget was a $126 million K-12 education spending increase that falls short of meeting a never-met, voter-approved threshold of 55 percent of essential local costs, though Mills would met a campaign pledge of raising minimum teacher salaries from $30,000 to $40,000. The leader of the liberal Maine Center for Economic Policy, which issued a budget framework with an income tax hike on higher earners, said it “locks in” the tax policy of former Gov. Paul LePage. A proposed state employee headcount increase of more than 100 positions may not be enough for the Maine State Employees Association, the union for state workers. What she predicted happened. LePage told WGAN on Monday that “the difference between Janet Mills and a drunken sailor is that a drunken sailor spends his own money.” He went on to criticize her for relying on what he believes to be overly optimistic revenue projections for the next two years and for ignoring the budget plan he left for her, which he said included tax cuts. Democrats will be quieter about their criticisms, letting their leaders on the budget committee try tp tailor the budget to satisfy progressives. The governor will have a chance to expand on things at 7 p.m. Lawmakers have a full Monday at the State House ahead of Mills’ State of the Budget address this evening. Seven legislative committees will meet today to consider 29 referred bills. Members of the Criminal Justice and Public Safety Committee at 10 a.m. will hold a work session to possibly vote on whether to recommend LD 94 for passage in the Legislature. The bill, which aims to prohibit teachers from distributing obscene learning material to students without their consent, received mixed reviews from teachers, parents and lawmakers last week. Other bills before committee today include LD 33, An Act to Establish a Thanksgiving Youth Turkey Hunting Season; LD 179, An Act to Change the Name of Columbus Day to Indigenous Peoples Day, and LD 150, An Act to Improve Attendance at Public Elementary Schools. Find the full schedule here. — Maine schools are again wrestling with what should be required of students before they can graduate from high school. Last year, the Legislature rolled back requirements that school districts use “proficiency-based” learning systems in which students must show they’ve mastered the state’s various academic expectations in math, English, science, social studies and four other subject areas to graduate. That leaves the state with a mix of different graduation requirements that vary from district to district. Approximately 25 percent of superintendents said they expected their districts to stick to proficiency-based diplomas, and 26 percent said they expected their districts to adopt a hybrid proficiency- and credit-based diploma. About 11 percent of superintendents said they could not yet accurately predict changes to their diploma criteria. — Lawyers for a woman accused of killing her 10-year-old daughter last year allege that her husband tortured her and the child. In court documents filed Friday, lawyers for Sharon Carrillo describe alleged acts of sexual and physical abuse committed by Julio Carrillo against their client and her daughter, Marissa Kennedy. Prosecutors have charged Sharon and Julio Carrillo with murdering the girl, who was Julio’s stepdaughter. Sharon’s attorneys are seeking a separate trial and to have information she gave to investigators suppressed, in part because they say Sharon was a victim, not an accomplice, in months of abuse that resulted in the child’s death. — The number of Democrats who want to be president in 2021 just keeps growing. Two U.S. senators officially launched campaigns this past weekend and other Democrats are hinting that they will soon follow suit. Massachusetts Sen. Elizabeth Warren kicked off her campaign Saturday, and Minnesota Sen. Amy Klobuchar defied blizzard conditions to announce Sunday that she’s running for president. Meanwhile, Colorado Sen. Michael Bennet hinted that he would soon join the crowded Democratic presidential nomination derby. — The federal government seems on the verge of another shutdown. The Associated Press reports that a special congressional committee impaneled to break an impasse between President Donald Trump and Democratic leaders over funding for a southern border wall hit a snag in talks designed to end the stalemate. Without a deal by Friday, funding to keep many government services in place will run out. Trump continues to let his staff handle negotiations as he heads to a campaign rally today in El Paso. Before Marie Kondo started sparking joy by throwing away other people’s stuff, there was Scott Thistle. Scott now works for the Portland Press Herald, But before he moved to the high-rent district of State House press row, he shared an office with us when he worked for the Sun Journal. Without windows, the place lacks ambiance. Add rows of institutional gray filing cabinets filled and topped with two decades of piled paperwork and detritus accumulated by a parade of frumpy, grumpy State House reporters and you can see why our office had become, at best, a grotto of grimness. Joy was not an option. So on what was shaping up to be a slow news day during the summer of 2013, Scott decided it was time to clean out the office. Moving with the speed and urgency of the ski rescue expert that he is, Scott — with me as his lumper — filled two Dumpsters with old reports, studies, notebooks and mail sent to people who had not worked there in decades. We kept the TV with built-in VHS player, but hundreds of pounds of other stuff disappeared. By Kondo’s standards, he sparked an inferno of joy, converting a dust mite heaven and catacombs filled with dead legislation and unopened mail addressed to people who retired last century into usable space. For that, we thank him. But I’m not letting him near my house. I am an affirmed packrat. Facebook reminds me that my wardrobe hasn’t changed since before there was Facebook. Our attic is filled with scorecards from 1960s Red Sox games, LPs, moldy photo albums, old newspapers, toddler clothes my kids wore 25 years ago and keepsakes like the football-shaped “Happy NFL Easter” card a neighbor gave me in the early 1980s.